The Bureau of Economic Analysis announced yesterday that U.S. real GDP grew at a 2.6% annual rate in the third quarter. Even factoring in the dismal start to the year, that leaves full-year GDP growth during 2014 at 2.4% (the best annual performance since 2010) and growth at an annual rate of 4% over the last 9 months. The data does not convey that spirit at all. 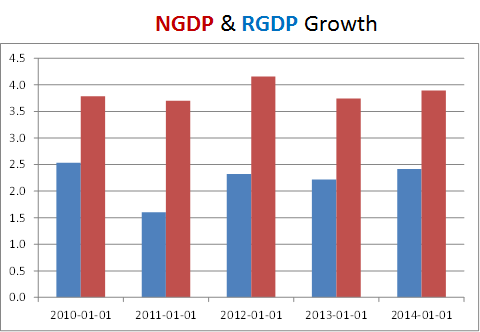 Real growth has shown little variation since 2010, mostly reflecting the maintenance of a rather low and stable NGDP growth. In other words, “mediocre” has come to mean “solid”! Note: The “shortfall” in 2011 real growth is largely due to the 20% rise in oil prices, which remained quite stable in the ensuing years. NYT: You want the Fed to move more quickly toward raising short-term interest rates even as inflation decelerates. Why aren’t you worried that inflation is below your 2 percent target? Plosser: We’ve all been kind of expecting this given what oil prices are doing. A few years ago when oil prices shot up, we looked through that, and it’s important that we do that now. It’s not been surprising to me that the headline numbers have been soft. The bigger question is what happens in four to six months. Will inflation begin to drift back up toward our target? I think it will. I’m kind of comfortable with that for now. The oil decline does seem to have at least stabilized. In sum, this year and next will be quite challenging. The economy will grow this year but at a slow pace, and the unemployment rate is likely to get worse before it gets better. At the same time, inflation will be uncomfortably high for a while. I am more optimistic about the outlook for 2009 and I expect we will see economic growth return to near its longer-term trend. 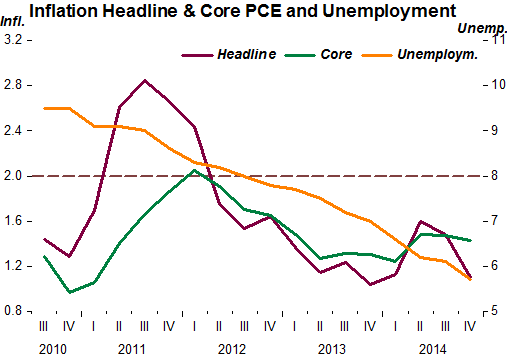 But to prevent recent inflation from continuing(!) to plague the economy and to avoid a rise in inflation expectations, I believe the current very accommodative stance of monetary policy will need to be reversed, and depending on how economic conditions evolve, I anticipate that this reversal will likely need to begin sooner rather than later. NYT: Your dissents over the last year basically took issue both with the Fed’s communications strategy and with the content of the message. What is wrong with the message? Plosser: We have had a better economy than we thought it was going to be; we’re way ahead of where we thought we were going to be. As a committee we say we’re data dependent. And if we’re going to be data dependent, we need to explain why we’re ignoring the data, why we’re not reacting to the data. Our forecasts are changing. Why aren’t we changing the message? Good ridance. Plosser will retire in March! Two central bankers on Friday explained why they both foresee a likely rise in rates despite an inflation environment that seemingly argues against such a move. 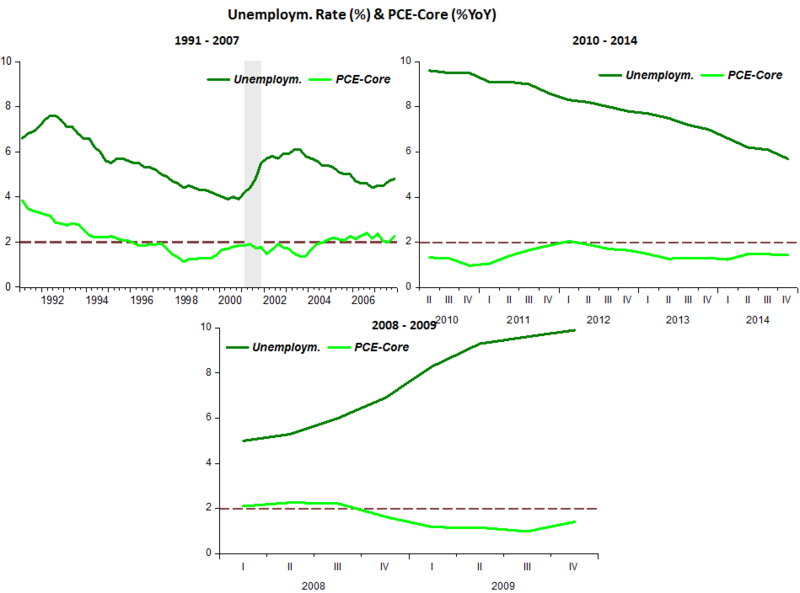 For John Williams of the San Francisco Fed and James Bullard of the St. Louis Fed, it comes down to a combination of success in promoting unemployment(sic) and growth, and their assessment of the overall influence of monetary policy. The drive to push up rates owes significantly to the fact the job market is likely to be at levels that should start generating inflation by year end, Mr. Williams said. So while the Fed is falling short on inflation, he continues to expect this situation to change. What’s more, with rates near zero right now, a small rate hike would still leave the overall stance of central bank policy at very supportive to growth. Mr. Bullard, speaking on Bloomberg television, has a more aggressive outlook for policy. Keeping interest rates near zero “is not the right interest rate for this economy. We are much closer to our goals than we have been in a long time. Inflation is a little bit low, but it is not low enough to rationalize the zero interest rate policy,” Mr. Bullard said. “As long as we feel confident that inflation will go back toward target…I think we are certainly able and willing” to raise rates, Mr. Bullard said. In past comments Mr. Bullard has echoed points similar to that of Mr. Williams. Put simply, a modest rise in rates is a compromise between the Fed’s job and employment mandates. Higher rates recognize success in lowering the jobless rate, while keeping them at historically low levels allows more job gains and growth that should over time allow price pressures to return to target. I wonder where these guys get these ideas. It´s certainly not from data and history. Where, for example, do we see over the last 25 years more job gains and growth increasing price pressures? And how can you “generate price pressures” with such a comparatively measly level of nominal spending growth? Urgently needed: Better screaning procedures in the selection of Federal Reserve candidates! Some observers of the Fed were complaining Wednesday that the FOMC statement should have rolled back plans for a mid-2015 rate increase. In their view, reduced rates of inflation observed currently, along with the strong dollar and weak nominal wage growth, should lead the Fed to postpone any rate increases. Such concerns are dead wrong. They reflect a deep misunderstanding of the time lags inherent in the removal of accommodative monetary policy, and confusion about the proper way to target inflation. Dovish critics are also wrong about how the Fed should respond to lower oil and gas prices, the strong dollar, and slow wage growth. A monetary policy shift from maximum accommodation (the present stance) to a neutral monetary policy posture probably will take about two years to accomplish, and certainly will take more than a year, given the maximum pace of raising interest rates that the Fed is willing to pursue. During the period that it is lessening accommodation, the Fed will still be contributing to expansion of nominal GDP growth, and thereby will be adding fuel to the economic fire. Given the built in lags in withdrawing accommodation, the Fed must begin to raise rates long before the economy is expected to achieve the long-run objective of 2% inflation and full employment. Beginning this long process of raising rates soon is essential to avoid over-heating over the next two years. As a financial economist he cannot think outside the box of “monetary policy equals interest rate policy”, seeing “zero” rates as maximum accommodation! 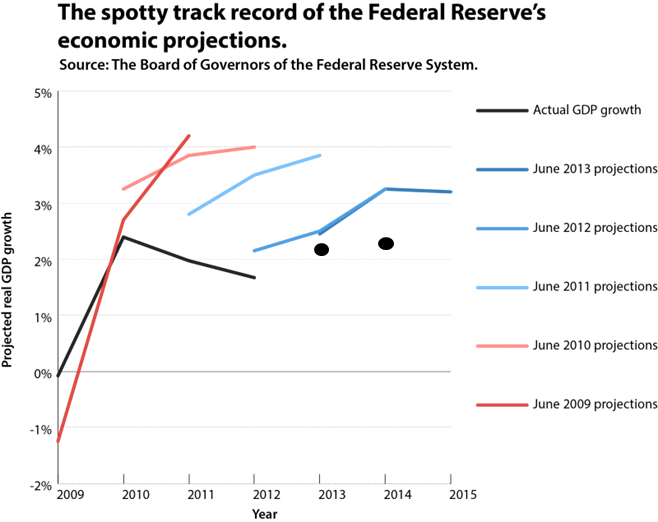 I love “the Fed will still be contributing to expansion of nominal GDP growth, and thereby will be adding fuel to the economic fire. You can only wish, because “fuel” is only “dripping” at such a slow rate that “fire” is never capable of catching on. So there´s no danger of “overheating” in the next two years. He should take a look at instances of regime change (1933 for example) to see how “short and stable” lags really are. He wrote that yesterday. Today, numbers for the last quarter of 2014 came out. Will he change his mind? I doubt it. His “conviction” is too strong! 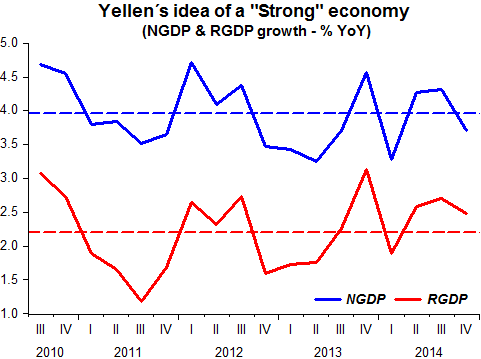 An upbeat Janet Yellen at a private luncheon on Thursday told Senate Democrats the U.S. economy is strong. Ms. Yellen conveyed that “things are going well” for the economy, unemployment is low, but some people are still hurting, Sen. Joe Manchin (D-W.V.) told reporters after emerging from the luncheon Thursday afternoon. “She feels the economy is strong, a lot is good,” he said. [reminding me of Peter Sellers as Chance the Gardner in “Being There”). That was also yesterday. What does she think today? A 2.2% average real growth rate may seem strong if you have the Eurozone in mind! Maybe a year ago, when inflation was higher, Calomiris would have been even more strident! Stanley Fischer, at the time (August 2012) head of the Bank of Israel, was very concerned with the “fiscal situation”. In his mind he was likely thinking how the BoI would offset the expansionary (inflationary) stance of fiscal policy. If so, I would like to describe briefly the current state of the Israeli economy and also refer to the measures that the Government is taking at the present time to maintain that situation. The economy is growing at a reasonable rate of 3 percent per year—slower than in the past few years but still faster than growth in the West. 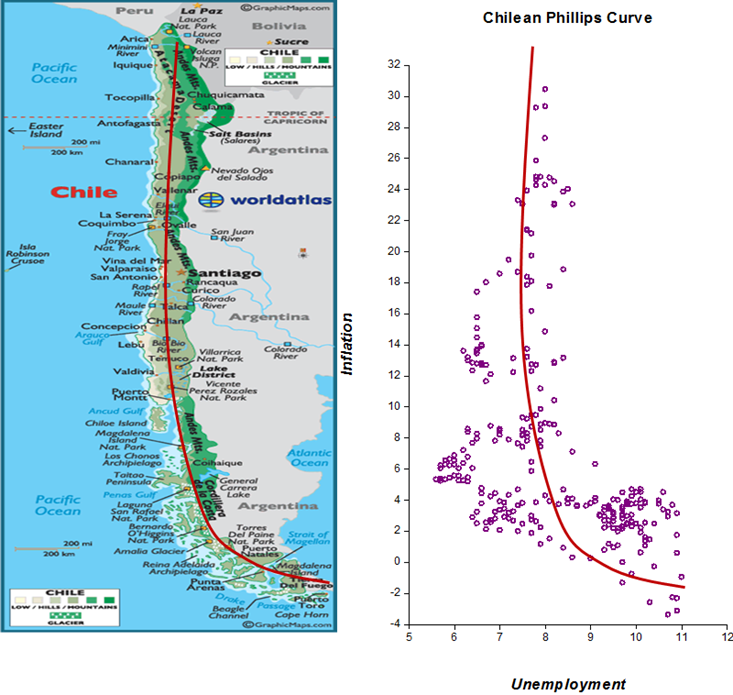 The unemployment rate is relatively low, inflation is low, and the exchange rate is positioned where it’s good for exports. The current account of the balance of payments will probably show a small deficit this year. The main attention today focuses on the budget measures that the Government has decided to take. This year, the budget deficit is expected to be 3.5 percent. This is a reasonable rate of deficit for an economy in recession but, as stated, that is not our situation. It’s too large a deficit for an economy that’s close to full employment. Unless the Government’s budget commitments in 2013 are accompanied by further actions, they will result in a deficit of 6 percent of GDP next year. This is an impossible rate of deficit for an economy that cannot expect outside assistance of any kind, one that has to stand on its own two feet. If so, what should we do? One approach says, “It’ll be okay.” Those who subscribe to this outlook hope that the economy will begin to grow a 5 percent rate all of a sudden and that the problems will be solved. In Europe, however, no growth is expected this year, and strong growth will not come to Israel from the U.S. or even from China or India. Therefore, we have no choice but to take care of ourselves, and it’s best to do it now while the economy is in a good situation. Therefore, the Government has resolved to strive for a 3 percent deficit next year, assuming that growth will also be around 3 percent. This is the purpose of the measures that the Government has decided to take—to bring the economy to a situation where it will be strong enough to cope with the expected difficulties next year from a position of strength and not of weakness. Governments that face elections usually prefer to wait until after the elections to tackle problems such as these. This behavior often leads to a crisis that erupts even before the elections. The Government of Israel has decided not to behave that way. I was very critical of the Government recently, not because I got pleasure from it but because I didn’t expect the Government to take the measures that it took. We are fortunate that the Government ultimately chose to deal with the situation. I think that if all the measures that the Government announced are carried out, the Israeli economy will be strong enough to cope with almost any problem that reaches us from abroad. If the global economy avoids catastrophe, the Israeli economy will be able to continue growing—for the wellbeing of the country’s citizens, the recent immigrants, and all of us. Coincidence or not, that marks the point in which the Israeli economy, after having weathered the crisis better than most, mainly by avoiding the large NGDP drop below trend that was characteristic of many developed economies, begins the steep slide “into the abyss”! 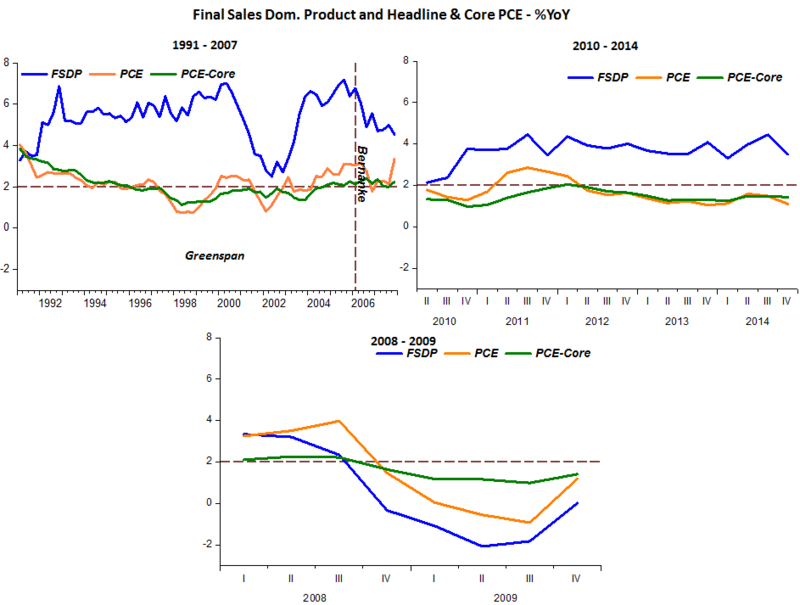 The next chart is “living proof” that falling/low interest rates do not indicate easing/easy monetary policy. 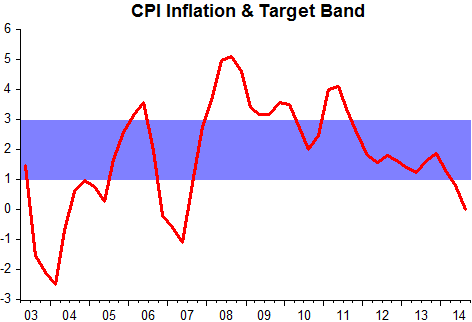 And inflation (which has remained less than half the time inside the target band) is now “kissing zero”. From a Market Monetarist perspective, the reason for the widening NGDP gap has an obvious monetary explanation. As the chart below shows, following Fischer´s speech money supply growth was strongly reduced while velocity was relatively stable. 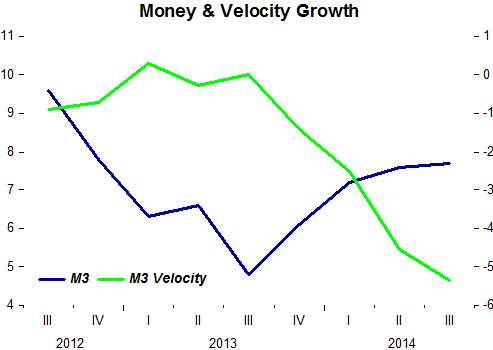 When velocity growth tanked (money demand went up), money supply growth was far short of what was needed to offset the rise in money demand! To meet month (actually every 6 weeks) after month and produce variants of this sort of gibberish is pathetic! The Federal Reserve once again left interest rates unchanged at a range of zero to a quarter of a percentage point, postponing a return to what it calls normal rates and reiterating that “it can be patient” in deciding when to begin raising rates. Why do many (most?) economists despise (hate?) money (and monetary policy)? More likely, as I´ll show, they are very much afraid of its power! This past weekend I reread Doug Irwin´s marvelous article on Cassel and the Great Depression. In many ways it´s like “back to the future”. Just call Keynes Krugman (PK)and Cassel Sumner. 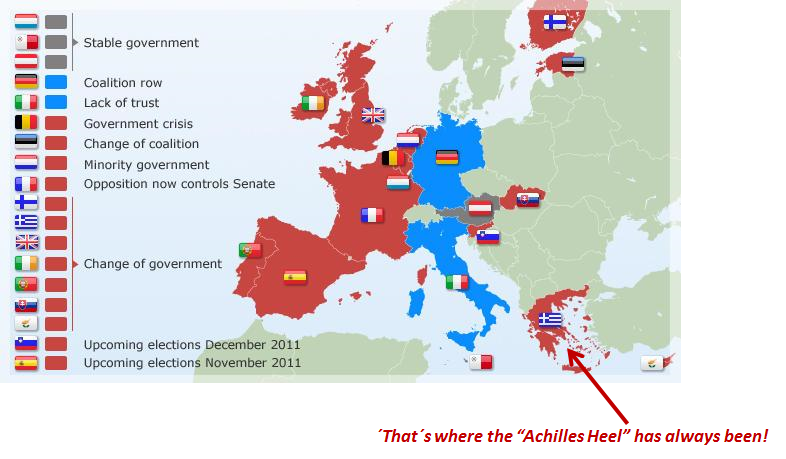 Take this passage from history and you´ll see that the current playbook is the same! [Note PK in 1997 on Japan: Now as a general rule modern economies are not supposed to suffer from prolonged periods of inadequate demand. There is usually nothing easier than increasing demand: just have the central bank (i.e., the Bank of Japan) increase the money supply, or have the government spend more. 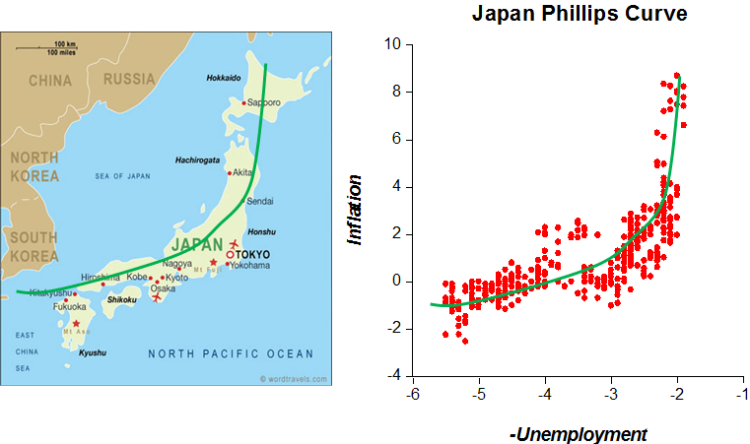 Why, then, has Japan suffered from low demand for more than half a decade? Well, there are some structural reasons. Japanese consumers still consume an unusually low fraction of their income, which means that companies must correspondingly be persuaded to maintain a high investment rate if the economy is not to have too little demand. The problem is aggravated because the troubles of the banking system have restricted the flow of credit. So to push demand high enough to get the economy back to more or less full use of its capacity would require a big stimulus. Still, why not provide that stimulus? 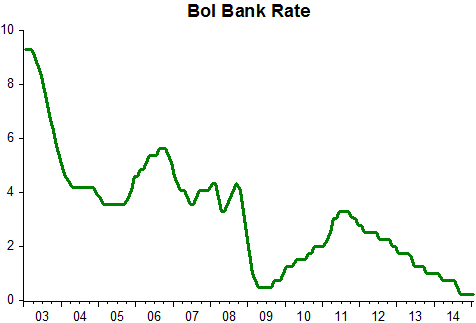 The standard answer goes like this: interest rates are already very low, so the Bank of Japan has done all it can. Meanwhile, the government has a severe fiscal problem, so it cannot increase spending or cut taxes. There is, in short, nothing to be done except pursue structural reforms and hope for an eventual turnaround. This answer sounds hard-headed and responsible. In fact, however, it is based on a completely false premise – the idea that the Bank of Japan has reached the limits of what it can do. The simple fact is that there is no limit on how much a central bank can increase the supply of money. As Keynes stated in late 1931, after Britain left gold, “I am not confident . . . that on this occasion the cheap money phase will be sufficient by itself to bring about an adequate recovery of new investment. . . . . If this proves to be so, there will be no means of escape from prolonged and perhaps interminable depression except by direct State intervention to promote and subsidize new investment” (Keynes 1982, 60). In the General Theory, Keynes repeated his skepticism of monetary remedies to a depression. He argued that “for my own part I am now somewhat skeptical of the success of a merely monetary policy directed towards influencing the rate of interest . . . it seems unlikely that the influence of banking policy on the rate of interest will be sufficient by itself to determine an optimal rate of investment. I conceive, therefore, that a somewhat comprehensive socialization of investment will prove the only means of securing an approximation to full employment” (Keynes 1973 , 164, 378). Because Keynes judged the stance of monetary policy largely if not exclusively by interest rates, with low rates indicating to him monetary ease, he became skeptical of the value of monetary policy as a stabilization tool when nominal rates were so low. [Note: the “far larger scale” came a few months later when in March ´33 FDR delinked from gold and the dollar depreciated. The changes were instantaneous]. I don´t think Keynes or Krugman despise (or hate) monetary policy. In fact, they believe it´s ´powerless in certain circumstances. On the other side the policymakers, the guys responsible for implementing monetary policy, also are fond of saying that monetary policy is powerless (when interest rates drop to zero). In this they are following Keynes who thought interest rates defined the stance of policy. But the real reason is that, as policymakers they are afraid of the “beast” under their care. The evidence for that claim is abundant! Throughout the “Great Inflation” Arthur Burns argued that inflation was a nonmonetary phenomenon (Unions, Oligopolies, Oil Producers, etc.). Inflation was a “bad outcome”, so we can understand Burns´ plea of “I´m not responsible”. But when the time came for him to listen to his own advice he “got the chills”! We all know how it developed. There was a feeling last spring that things were going pretty fast … we had about six months of incipient boom conditions with rapid rise of prices, price and wage spirals and forward buying and you will recall that last spring there were dangers of a run-away situation which would bring the recovery prematurely to a close. We all felt, as a result of that, that some recession was desirable … We have had continued ease of money all through the depression. We have never had a recovery like that. It follows from that that we can’t count upon a policy of monetary ease as a major corrective. … In response to an inquiry by Mr. Davis as to how the increase in reserve requirements has been in the picture, Mr. Williams stated that it was not the cause but rather the occasion for the change. … It is a coincidence in time. … If action is taken now it will be rationalized that, in the event of recovery, the action was what was needed and the System was the cause of the downturn. It makes a bad record and confused thinking. I am convinced that the thing is primarily non-monetary and I would like to see it through on that ground. The argument that makes me most uncomfortable here around the table today is the suggestion several of you have made—I’m not sure you meant it this way—which is that the actions by this Committee contributed to the erosion of confidence—a deeply unfair suggestion. … But please be very careful, certainly outside this room, about adding to the perception that the actions by this body were a substantial contributor to the erosion in confidence. So saying “we´ve done all we could” or “we are out of ammo”, is the safe bet! PS And Woodford´s NK Bible is just “Interest & Prices”. Money has “dissapeared”! [the] end of extended unemployment benefits at the start of 2014 explains much of the pick up in employment growth in 2014 compared with 2013. The story would be that the end of benefits gave people an incentive to find work. Their method is to compare the change in employment in states that previously had lengthy periods of benefit duration with states where benefit duration was already short prior to January of 2014. The argument is that in the states that previously had long benefit duration we should expect the cut in duration to have a large effect. By contrast, in the states where benefit duration was relatively short, we would expect to see little effect. This means that we should see a bigger uptick in job growth in 2014 relative to 2013 in the states that previously had long periods of benefit duration than in states that had short periods. This runs completely counter to the claim that shortening benefit duration provided a boost to employment growth. The states in which HMM expected the cuts in duration to have the greatest effect on growth actually saw less of an uptick than the states where they expected a small effect. This is consistent with prior research showing that the main impact of cuts in benefit duration is that more people leave the workforce, not that more people get jobs. The incentive effects ofthe elimination of extended benefits increases labor supply and contributes to keep wages ‘in line’. Those that have a hard time finding employment drop out of the labor force and so the unemployment rate falls.